Various speakers speaking at the send-off dinner for the team had one single message for the team ‘bring home the trophy’ as the Mamulas envision the challenge of becoming the first Solomon Islands eleven-a-side team to qualify for the FIFA World Cup. Chairman of the Solomon Islands Football Federation (SIFF) Normalising Committee, Barnabas Anga, told the members of the squad everything is now in their hands as the nation sends them off on their mission. “The whole of Solomon Islands is united with you in your every match at the championship. We have put our hands together to enable you to attend this competition but now everything is in your hands and we look forward to receiving you with the trophy when you return home,” Anga says. Chief Executive Officer of Our Telekom, Loyley Ngira, also attended the event and signified the farewell dinner as one of importance in the lives of young Solomon Islanders. “I remember as a young child being sent to attend boarding school away from my parents and relatives and a farewell feast will be held in our honour where the chief would challenge us to empower ourselves and return home to help our people,” says Loyley. 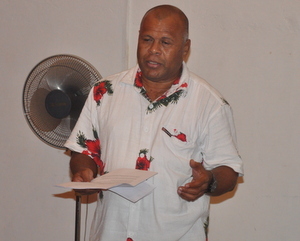 In Fiji, the Mamulas will meet up with the rest of the line up for the championship which includes Papua New Guinea, American Samoa, New Caledonia, Vanuatu and the hosts. Both New Zealand and Tahiti, the only countries to have won this competition previously, are not attending the championship. Solomon Islands have twice finished in second place, behind Australia in 2005 and New Zealand in 2011. Tahiti won the inaugural competition in 1976 and again in 2008 after beating New Zealand in the final.